Yesterday, the S&P 500 continued to make new highs for the year, almost reaching the round number 1050. But even as this major index continued to climb, several measures of internal market breadth haven’t kept up the same pace. The last time I mentioned a similar divergence was in June 2007 when the Nasdaq McClellan Summation Index was coiling as the S&P 500 was acting strong. Of course, armed with hindsight the S&P 500 didn’t soldier on much higher. While the breadth measure showed a weaker and weaker market internal, the index finally succumbed to a severe bear market. Having said that, I’m not sure that this is necessarily a huge red flag for the market. Well, let me backtrack a bit. I think it could potentially be slightly negative but only in the short term. In the long term, there are other forces at play which seem incredibly bullish. 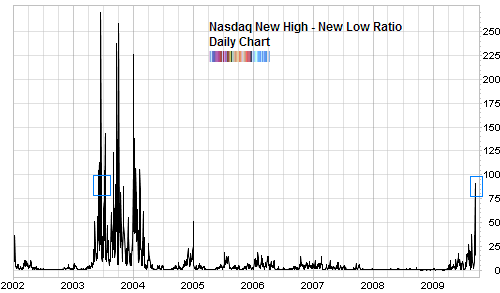 The last time we saw the stock market behave with the same single minded intensity was in the summer of 2003. And that set the stage for a cyclical bull market, of course. … what this analysis tells us is that the recent rally was one where a small subset of the S&P 500 rallied, pushing the averages higher. 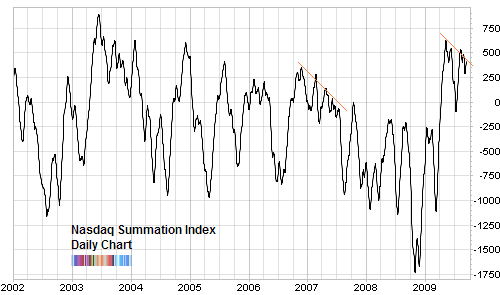 To see a change in market tone, we need to see almost all shares trade above their long term moving average. We can not start a healthy bull market with a few extremely strong shares pulling the rest along for the rise. I think we arguably have that now. In fact, if we look at the breadth chart which was featured in that past post, we see 95.6% of S&P 500 components above their 150 moving average. That’s higher than the brightest interval in the 2003 bull market launch. And turning to the more short term breadth measure, there are 92.6% of the S&P 500 trading above their 50 day moving average. To see equivalent positive breadth, we would have to go back to the early days of the 2003 bull market. The next trick the market has to perform to convince me that this is indeed a genuine cyclical bull market is to maintain positive breadth at this level (or close to it). And to do this, even if we have some profit taking in the S&P 500 itself. That is exactly what we saw throughout 2003 and into 2004. So far, today’s market is showing promise in this regard as well. The shallow correction in July of this year was met with an equally shallow breadth damage: the percentage of S&P 500 components trading above their 150 moving average didn’t fall below 60% before recovering smartly. Over all, this market has defied the vast majority of traders and investors in rising as far and as fast as it has. The recent divergences we are seeing are negative but the nature of divergences are that if they do not have a consequence in the short term, they can continue for much longer than most predict. Much more important in my view is the powerful breadth which is propelling the index higher. Rather than just a handful of stocks taking the averages higher, we are seeing an almost unanimous participation. And that not only bodes well for the continuation of this rally, it speaks of a change in underlying tone. As a new trader. This article was extremely informative for me.